Overview: The tales of the angry green goliath continue in this second Hulk Essential volume. We see Bruce Banner still being hounded by General Ross and the U.S. Army. Betty Ross must rebuff the interest shown by Major Talbot, as her heart still remains true to Bruce. And the Hulk shows that most times the true monster in the book is not him, but the humans fighting him. With these stories, we see the Hulk start to crossover with characters from other books. There is a multi-issue arc where the Hulk teams up with Thor and the Warriors Three; Bruce Banner and his alter identity cross paths with Ka-Zar in the Savage Land; and another story line features the Hulk battling the Mandarin, which leads to an obligatory appearance by Iron Man. A highlight of the book would be the inclusion of the first Incredible Hulk Special (Annual). Written by Gary Friedrich with art by Marie Severin, the Hulk encounters the Inhumans, which had been exclusively supporting characters in the Fantastic Four book until this point. What makes this memorable is the cover by Jim Steranko, which shows the Hulk bent over while holding up the book logo made out of rock. The image has been the subject of numerous homages over the years. What makes this Essential? : This should be a better book, given the talent of the creators. That said, this collection of stories feels very average. My opinion here, but it feels like Marvel was more concerned with just having a book on the newsstands each month compared to the content of the stories. If you are a Hulk fan, get it only if you are wanting to read his complete journey. 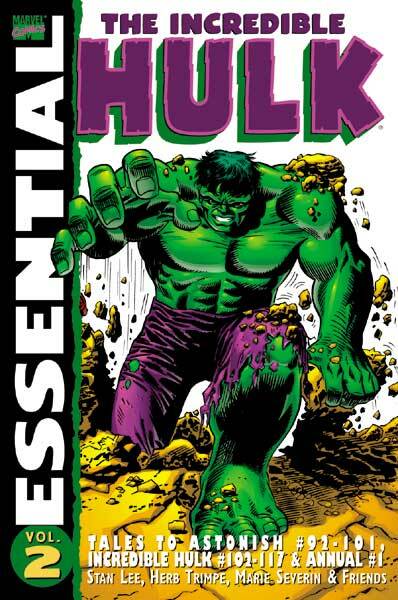 Footnotes: This Essential also includes a back-up Hulk story from Incredible Hulk #147. It is uncredited on the front cover of the Essential, but it is listed in the table of contents. The back-up story was also reprinted, along with the original story, in Essential Hulk Vol. 4. The Hulk was one of two features printed each month in Tales to Astonish. Since issue #70, the other back-up feature was Namor, the Sub-Mariner. For issue #100, the two characters teamed up for a full-length story. Tales to Astonish ends with issue #101 (March 1968). The following month, the title was renamed The Incredible Hulk, and continued with the same numbering. Namor jumped to a one-shot special, Iron Man and Sub-Mariner #1 (April 1968), before moving into his own solo book, The Sub-Mariner #1 (May 1968). If you like this volume, try: Marie Severin: The Mirthful Mistress of Comics by Dewey Cassell. This book was released by TwoMorrows Publishing in the summer of 2012. Right or wrong, comics are perceived to be a man’s interest. Men are the primary creators (writers, artists, colorists, etc.) of primary male characters printed in books aimed at boys and men. The truth is that while men constitute the majority of creators, there are many female creators in the comics industry. Marie Severin got into the industry in the 1950s, when her brother John Severin needed help getting a project colored for EC Comics. From there, Marie pitched in as colorist, inker, penciller, letterer and whatever else needed to be done. She was a mainstay in the Marvel Comics offices for three decades, working on a variety of titles including The Incredible Hulk, The Sub-Mariner, Kull the Conqueror and others. She even colored the first issue of Marvel’s adaption of Star Wars in 1977. This book provides a detailed look at Severin’s career. This entry was posted in Hulk, Marvel Essentials and tagged Gary Friedrich, Herb Trimpe, Hulk, Marie Severin, Roy Thomas, Stan Lee. Bookmark the permalink. Amazing! I love your level of detail and examination into the book. Very well done!